Here is a list of good controversial speech topics to consider using for your next presentation. Remember these are ideas for controversial speeches, so you don't want to just inform your audience of the subject. You need to pick a side and make an argument that your view on the topic is the right one. I hope you found a few good controversial speech topics that inspired you! 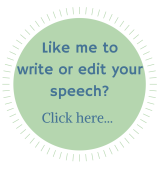 If you've written a controversial speech and would like to share it with visitors to Best Speech Topics, please send it in! I'd love to hear from you.